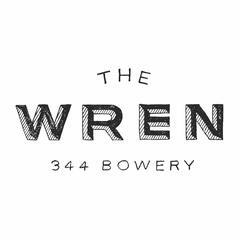 The Wren is the anchor of the eclectic bar and restaurant community of the Bowery neighborhood, named for the old Irish pagan tradition of parading a wren bird through the streets the day after Christmas. Opened in 2011, the bar is a bustling, high-volume gastropub serving unassuming yet excellent food by Chef Russell Ashton in a cozy atmosphere, and is proud to be known as the neighborhood trend-setter in a burgeoning eating and drinking destination. An outstanding vintage beer list is served in addition to the unfussy but carefully considered cocktails. The Wren has been lauded by the New York Times and Time Out, which praises the bar's "gussied up Irish classics" and the "urban chic" decor, which "channels Dublin's stylish boîtes." The Infatuation notes that the bar "gets crazy on weekends" and is always "a comfortable and fun place to drink whiskey. "<br><br>The Wren is part of Sleeping Giant NY (harri.com/sleeping-giant-ny), a family of independently operated bars united by a shared work culture and the chance for employees to grow and explore opportunities across different locations. To learn more, please visit www.sleepinggiantny.com.